The right plant selection can sometimes make the difference between upkeep and truly enjoying your garden. Beautiful, hardy, easy to grow and maintain, deer and rabbit resistant – these are the most wanted features on a Canadian gardeners’ shopping list. It also helps if a perennial is drought or heat tolerant too. It’s a tall order to find all that you want in one great plant, but these selections can be easier to find than you might think. 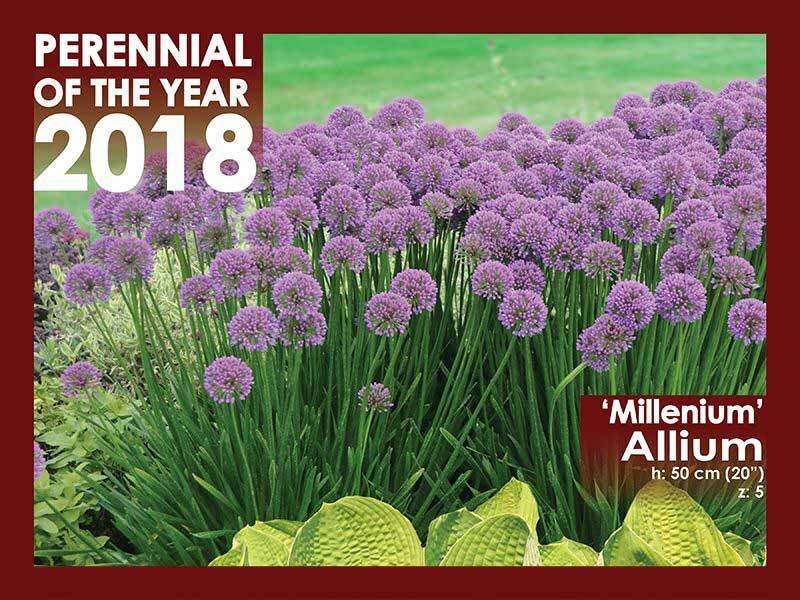 Each year the Perennial Plant Association highlights an exceptional variety that stands up to wide ranging climate conditions and performs well across Canada’s major growing regions. This year’s top pick: Allium ‘Millenium.’ It’s quickly becoming a classic, foundation perennial in garden landscapes. An ornamental onion, Allium ‘Millenium’ forms a dense clump of strappy deep green foliage, 30-35 cm (12-14”) tall and wide. In late spring, its distinct, uniform appearance complements many other garden perennials. First blooms appear in mid-July and throughout August masses of perfectly rounded rose purple blooms simmer over the fragrant foliage. The large 5 cm (2”) spherical blooms are long-lasting too, up to 4 weeks. Robust and hardy, Allium ‘Millenium’ is a magnet drawing in honeybees and butterflies, while repelling deer and rabbits. It’s a great plant companion to Gaillardia ‘Mesh Peach,’ Solidago ‘Little Lemon,’ and Perovskia ‘Little Spire.’ Plant them all and establish a pollinator’s paradise. Easily grown in well-draining soils and full sun, ‘Millenium’ will enjoy a bit of partial shade in the hottest of climates. Once established, it tolerates heat and drought conditions, keeping up appearances all summer. Unlike other alliums, Millenium produces little viable seed, which means self-sown seedlings aren’t an issue. It’s easy to maintain too, just cut back foliage in the fall. Hardy to zone 3.